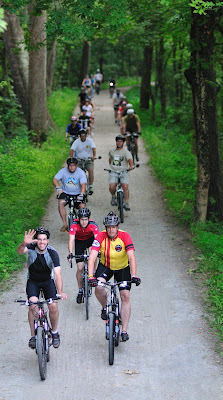 Saturday 8/30 at 7:30AM: STOMP Bicycle Adventure, Cuyahoga Valley National Park/Howe Meadow. CC's very own Gary is doing the ride-start SAG for Summit Tour of the MetroParks, which has 63, 25, and 10-mile options, all of which are scenic and hilly. Registration limited to 1,600. Click here for more details. Saturday 9/6: Bike With Bachman, Bath Township Hall. This is your last chance to ride along with Summit County Engineer Greg Bachman as he inspects Summit county roads by bicycle. At a time when everyone is complaining about the government, something like this comes along that's pretty cool and restores a shred of faith. Details here. Sunday 9/7: Hancock Horizontal Hundred, Findlay OH. Century Cycles owner Scott Cowan will be at the pre-ride expo with a CC display on Saturday night and is planning to ride it, too. Click here for the event website, which states "join us for one of the flattest rides in Ohio. Great ride for a first century attempt." So there you have it! Sat/Sun 9/6-7: Big Valley Race and Festival. There is something for everyone at this two-day bicycling festival located at the Camp Manatoc Boy Scout Camp in the CVNP in Peninsula. The info says: "Come and appreciate this two-wheeled journed known to a privileged few as the 'Manatoc Experience:' Because you know it's never too late to have a life, and it's never too late to change a life." Life-having-and-changing details here. On this section of Century Cycles' website, we always maintain a schedule of events, rides, and tours. If you are an event organizer, please e-mail your event details to info@centurycycles.com for consideration. I've missed the last couple of night rides, but I'm charging up the light for this one. I'll see ya there!